Hey guys! 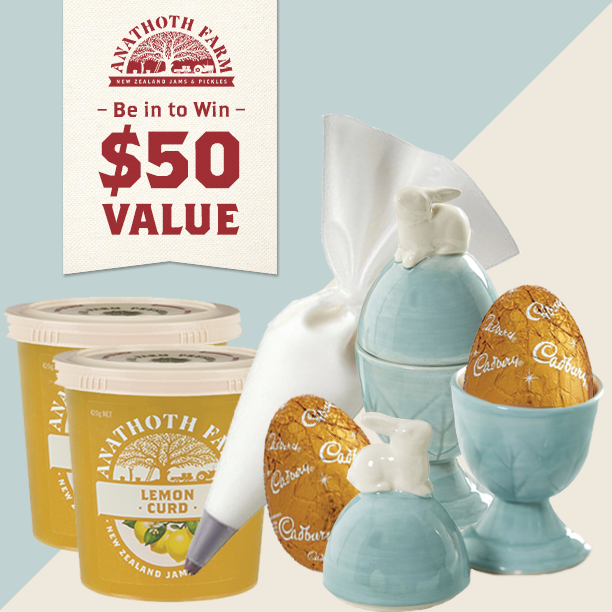 I’ve recently teamed up with Anathoth Farms to do a special giveaway for you all! I remember I received a jar of Anathoth’s Sweet Chilli Relish several years ago and it languished in my cupboard for several months without a glance before I decided to sample it. After I did, I was annoyed with myself for leaving it for so long. It was the kind of relish you want to put on everything! I’m a huge fan of making easy Ploughman’s style platters at home when I can’t be bothered to cook (which annoyingly happens more often than I’d like) & that relish was particularly good with cured and smoked meats. Definitely a memorable relish! Anathoth recently teamed up with the amazingly talented blogger Iron Chef Shellie to create an Easter themed recipe – for White Chocolate Cheesecake Easter Eggs filled with Lemon Curd to create the egg ‘yolk’ which reminds me of one of my all-time favourite Easter treats, Cadbury Creme Eggs! I love this idea and think it would be so fun to serve to family and friends this Easter and would be a great to make with kids as well! If you don’t have access to Anathoth lemon curd, you can always try making some at home, although having pre-made curd definitely makes this dessert faster and easier to make. This is not a sponsored recipe, just a giveaway for CookingCrusade.com readers. Please note that this prize does not include the Anathoth lemon curd. To enter, all you have to do is leave me a comment at the bottom of this post telling me what your favourite chocolatey Easter treat is and then enter your submission below. Please note this giveaway is open to Australian entrants only! Being a South Australian born & bred, my favourite chocolatey Easter treat is, of course, anything from Haigh’s, but in particular the chocolate bilby! I like the chocolate hot cross buns! I love chocolate hot cross buns, the mutant child of tradition and indulgence. I have a soft spot for those half eggs full of stuff, particularly ones that involve caramel and honeycomb, just add fresh raspberries – perfect Easter treat. Those egg cups are so cute! It would have to be hot cross buns heated up and slathered in butter! Ferrero Rocher – it is just an amazing piece of wonderful. The chocolate and hazlenuts are so scrumptious and delicious! I love Kinder Surprises. My kids love taking the toys and building it.